Does a machine ever make things simpler in the kitchen – or just add yet another thing to clean?! Think of the Cuisinart, Kitchen Aid and Vitamix, these super kitchen appliances streamline labor intensive baking prep – and give you more time to spend sharing your treats with those you love. And with only one container to wash, add little extra clean-up. Work savers, time saver and clean up savers, home cooks can’t wait to get their hands on these appliances. Items like the Kitchen Aid are milestones for many home bakers – who have taken their commitment to baking to the next level. Yet there’s a gap in just what these appliances can do. They can shop, shred, blend, and cream just about anything. They can make the smoothest chocolate mousse you’ve ever tasted. So what’s missing? What’s missing is the first, elemental step in ingredient preparation: ingredient measurement. Making the smoothest chocolate mousse you’ve ever tasted begins with the right weight of chocolate and sugar. Professional bakers use weight to control their results and yield consistent baked goods. Unfortunately, weighing flours, sugars and wet ingredients separately is a tedious back and forth of scooping, spilling and pouring. The home baker needs a streamlined way to precisely measure and dispense dry ingredients, without all the time and hassle. Fortunately, the PantryChic™ Store and Dispense System™ is currently in development to solve just this! 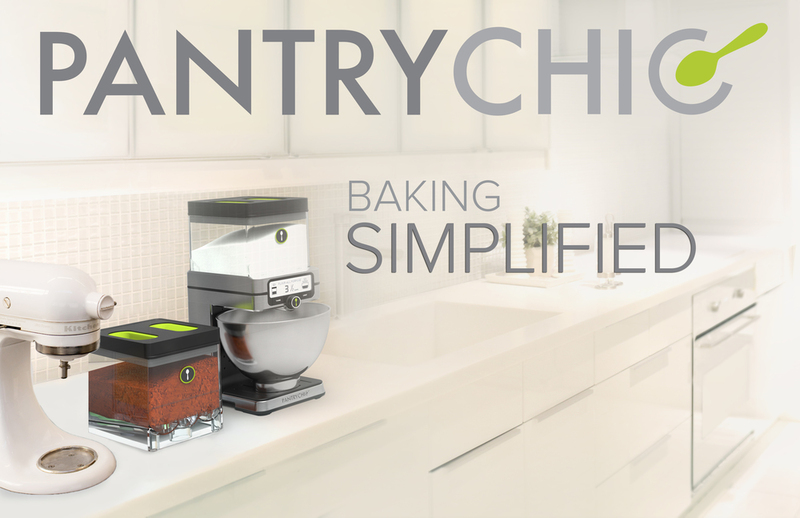 Organization with the PantryChic ™ Store and Dispense System™ is intuitive and refined. Storage containers neatly fit together in your cupboards or on the counter top, and can be placed directly on top of the scaled, and dispensing base. To use: Just place your ingredient canister of choice on the base, select the quantity on the interface, and the unit dispenses the programmed amount into your bowl. Three steps make great baking even greater.